The second showing of "Tagalogue Vol 3: Within Us A Tribute to Our Ancestors" had attendees walking up a narrow staircase into a dimly lit, small white room packed with people shoulder to shoulder, and barely any distance between the performers and the front row. It was intimate. As the night commenced I soon realized the proximity mimicked the material. With every personal story of history, struggle, and identity, heads from the audience nodded in recognition like a silent chorus of "me too"s. There was no question: "Tagalogue" was going to hit home, and whether you knew it or not, sitting there made you a partner of its prose. History certainly loomed overhead with each story. But, even if the performers were years removed from their tale their words felt immediate, stinging like fresh wounds. There was loss: Larry Tantay wrote "Mary Lou Tantay," a beautiful piece on the last days with his mother, played impeccably by Renee Rises, who succumbed to cancer. There was connection: Jana-Lynne Umipig's excerpt from her original work "Journey of a Brown Girl" summoned women of Philippine past to the present. There was conflict: J. Gabriel Tungol's "Another One of These Type Dudes" raised questions of authenticity in Fil-Am identity. There was even humor: RJ Mendoza's "My Main Man" had everyone guffawing over his endearing relationship with his lolo. In every performance, there was love. There was the 14-person cast's love for their craft, love for each other, and from every corner of the room–a love for our culture's past. "We are experiencing a Filipino arts renaissance!" and I immediately wrote the phrase down. The words resonated in the room: Filipino. Arts. Renaissance. Up to now, it's nothing new that the Pilipino population is abundantly blessed with singers, dancers, and writers, but seeing a Pilipino artist in the performing arts was always an exception (think of the national worship over Lea Salonga). "Tagalogue" introduced a time for change, and now I'm looking forward to seeing a rise of productions for and by our community. The Pilipino/Fil-Am experience has yet to be in the public spotlight, but if that small white room was any indication of what's to come... we're definitely getting closer. Tagalogue - Final Show this Friday, Oct 25th! This Friday, be sure to come out to Tagalogue, Vol. 3 - Within Us: A Tribute to Our Ancestors. Directed by Andre Ignacio Dimapilis, and assistant directed and produced by Precious Sipin, Friday's performance is the third and final performance for this year. Space is limited, so be sure to RSVP soon! 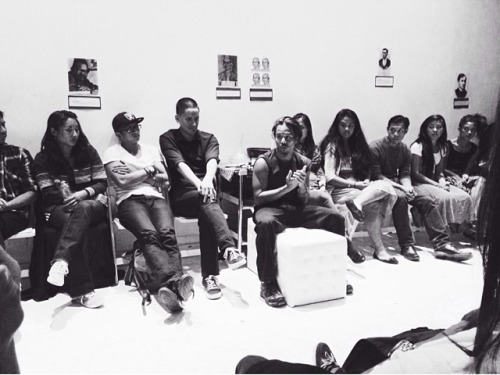 Tagalogue is a movement set to empower, unite, and celebrate the Filipino and Filipino-American people. We are the Filipino experience of living and struggling in our skin. OUR voices and OUR stories need to be heard and told to educate, inspire and remind us that we are connected, not alone.